State and local officials joined with community leaders Monday to announce outreach efforts to ensure Connecticut’s population is counted as accurately as possible in the 2020 Census. The every-ten-year “decennial” Census is still more than a year away, but there’s a lot riding on getting it right. The results serve as the basis for research, business decisions, policy-making, federal grants that for Connecticut add up to about $8 billion, and even determine how many seats states get in the U.S. House of Representatives. Lt. Gov. Susan Bysiewicz was joined in her State Capitol office by local officials and representatives of schools, community health organizations and other social services nonprofits to announce the formation of the Connecticut Complete Count Committee (CCCC). Complete Count Committees exist around the country. Connecticut’s CCC will also help with the formation of smaller Local CCCs. Much of the work cut out for these committees is a public relations campaign to get more people to respond to questionnaires that go out in the mail, or — new this decade — to complete them online. When people don’t fill out those surveys, the Census Bureau has to begin the difficult and expensive task of knocking on doors to complete its count. Bysiewicz said about 22 percent of the state’s population lives in hard-to-count areas. 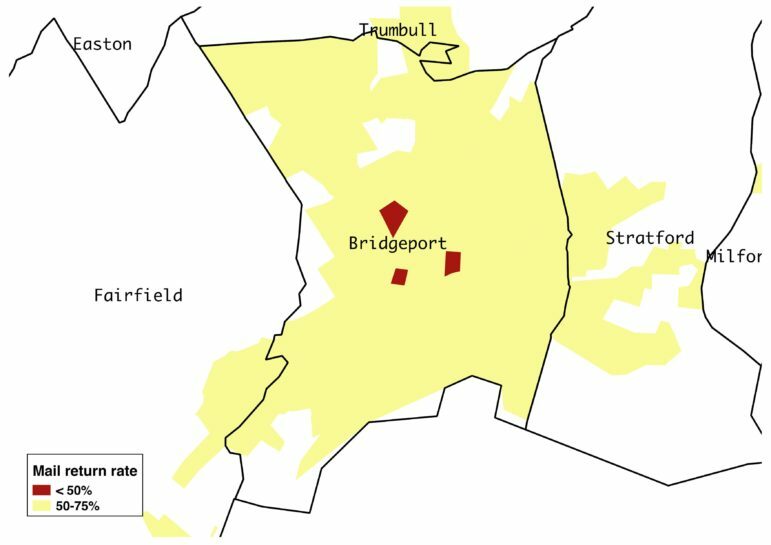 While in most of the state, 2010 Census questionnaires were returned at rates upwards of 75 percent, most of Bridgeport had return rates between 50 and 75 percent, and a few areas with return rates below 50 percent. Part of the challenge is getting people to trust that they can safely provide personal information to the government without repercussions. State Rep. Christopher Rosario, D-Bridgeport, applauded Bysiwicz for her work coordinating Census count efforts and acknowledged there is “fear” in his district he worries might affect the accuracy of the count. Rosario was referring to a question about citizenship added by the Trump administration. Critics fear the question will suppress participation in the Census, leading to certain populations, especially minorities and immigrants, being under-represented. 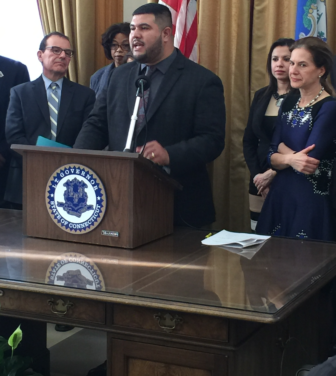 State Rep. Christopher Rosario of Bridgeport says overcoming fear, particularly among the Latino community, is critical to ensuring Connecticut gets an accurate count in 2020. The citizenship question is at the center of an on-going legal battle between the Trump administration and attorneys general from many states, including Connecticut. It is expected to reach the Supreme Court, the New York Times reports. Whether or not the question remains on the final questionnaire, officials have consistently said that participants in the Census, even those who are here illegally, don’t have to worry that information they provide could lead to their deportation or other consequences. Ian Hull, a Census official for the region that includes Connecticut, emphasized that his agency is prohibited from sharing personal information with federal agencies, including law enforcement and ICE. Hull said the Census also needs help promoting its recruiting efforts to staff field offices in Connecticut.